The Country Store & Event Farms is pleased to announce the upcoming opening of their Country Corn Maze. The maze covers 10 acres with almost 5 miles of paths through the corn. That adds up to nearly a million stalks of corn! 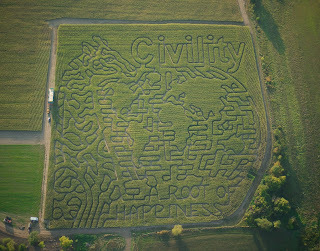 "Civility - A Root of Happiness" is the theme of this years maze. Families and individuals can embark on a journey filled with challenges, learning experiences and good-old-fashion fun! The young and the young at heart will thrill at this opportunity to navigate and explore the miles of twisting, turning paths, with a scattering of clues to help guide you through to the end. It will be an incredible adventure that will stimulate the imagination while encouraging both individual and team work! Be sure to also check out the haunted Town of Tormented Souls and other activities happening at the Country Store & Event Farms!!!! The Country Corn Maze, opening October 1, 2009 - will be open every Thursday, Friday, Saturday & Sunday through October 31, 2009.